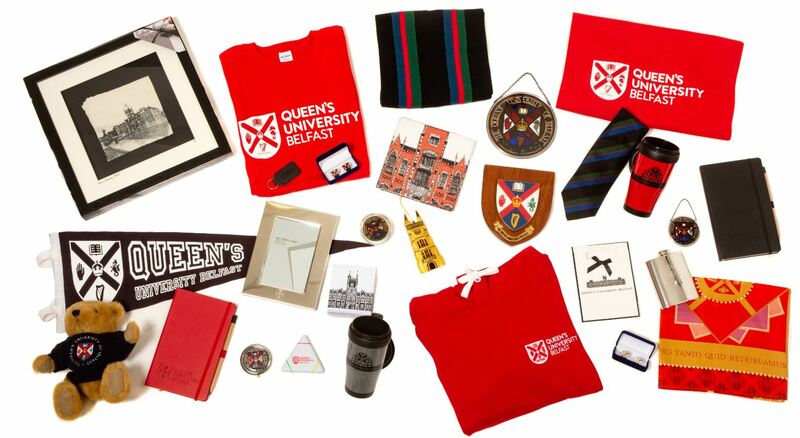 QUEEN’S WELCOME CENTRE OFFERING AN EXCLUSIVE 10% DISCOUNT TO ALL GRADUATES ON ALL ONLINE MEMORABILIA PURCHASES! Queen's Welcome Centre, based in the University’s landmark Lanyon Building and which has welcomed thousands of visitors and graduates from around the world for over twenty years, has launched an online ecommerce site. To celebrate, a 10% discount will be applied to all online purchases with the use of code: ALUMNI18. Founded in 1995 as part of the University’s 150th anniversary celebrations, Queen’s Welcome Centre is now the Northern Ireland Tourist Board Local Information Office for South Belfast and a ‘one-stop’ shop for all official University branded memorabilia. In recent weeks, the Centre launched an online retail facility, showcasing a range of Queen’s branded merchandise and making gifts and memorabilia available to the University’s 180,000 graduates around the world. While the University’s distinct new branding is represented, a full range of traditional crested items is included in a dedicated heritage collection. So whether it is a reminder of your time here as a student, a gift for family or friends, or a token of appreciation for a colleague or guest, Queen’s Welcome Centre offers something for everyone. Commenting on the new online facility, Welcome Centre Manager Sara Johnston said: “We are delighted to announce the launch of our new online shop and to offer this 10% discount to all our worldwide graduates. Among the Queen's branded goods and gifts available through the Welcome Centre are ties and t-shirts, crystal and ceramics, scarves and stationery and prints and pennants. Also on offer are cufflinks, hoodies, jewellery, teddies, and much more, all carrying the distinctive University crest or logo. In addition to online shopping, Queen’s Welcome Centre regularly hosts one-off events and exhibitions as well as guided campus tours by prior arrangement. Staff are also on hand to offer support and advice with any queries visitors may have about the University and the surrounding area. “Queen’s is now an established stop for the dozens of cruise ships visiting Belfast, not to mention for the hundreds of sightseeing busses showing visitors our wonderful city. Situated where we are right in the heart of the University’s famous Lanyon Building, we are ideally placed to welcome graduates and tourists and of course staff and students,” said Sara. The Welcome Centre is located just inside the front door of the main University building designed by Sir Charles Lanyon. It is open from 8.30am-5.30pm (Mon-Fri) and 11am-4pm (Sat & Sun). For online purchases visit the Welcome Centre shop; for further information go to the Queen’s Welcome Centre website, telephone +44 (0)28 9097 5252 or email Sara at queens.welcomecentre@qub.ac.uk.